Snoring is often stereotyped as something that only guys do; and not without good reason. We all know guys that seem to be dreaming that they’re lawnmowers every time they sleep. Though research on patients with snoring problems shows that males are most often affected, women are not by any means immune to it either. The truth is that snoring is not that much more common in men as it is in women. What’s more important, is that snoring is equally detrimental to the health of both sexes. That sweet, calming sound that many of us have to bear with while trying to catch some ZZZ’s at night is more than just an annoyance. It can put a strain on the heart, affect sleep quality, lead to light sleep, and event affect libido and relationships with your bed partner. Whether you are the snorer, or the poor soul that has to put up with a snoring bed partner, this article is meant to show you what causes snoring in women so that you can deal with the root causes and stop it in its tracks. What causes snoring in women? First, let’s have a quick look at what causes snoring in general. When you breathe, air flows through your orofacial muscles. These are comprised of the soft palate, uvula, tongue, jaw, etc. Upon falling asleep, these muscles begin to sag and relax. As this happens, they can start blocking some of the air passing through your airways. This blockage is what leads to vibration of the different muscles and ultimately causes snoring and possibly sleep apnea. These vibrations are what produce the snoring sounds. There are many factors that can make snoring worse. Some of these include mouth anatomy, nasal congestion, and alcohol consumption. However, the main culprit behind the huge annoyance that is snoring is being overweight. As body weight increases, the amount of fat around the neck increases. Greater fat around the neck leads to smaller airways which leads to more breathing obstructions. This is also the same way that weight gain worsens sleep apnea and one of the reasons why both sleep issues are closely related. Believe it or not, some people are born to be snorers. Genes play a huge part in our physical and mental make-up. And now, according to the British Snoring and Sleep Apnea Association, genes might be the first factor guilty of causing some women to sound like growling hippos at night. The reason for this is that people can inherit breathing patterns and physical traits that might increase the likelihood of airway obstruction and put you at a greater risk for snoring and sleep apnea. This means that if your grandparents or parents snore, you might have a higher likelihood of snoring too. This isn’t even taking into account inheritable factors that can predispose you to snore more. One example is lower metabolism leading to weight gain. Most people face allergies, sinus infections, and other illnesses that cause nasal congestion at multiple points throughout the year. Mucus can block the airways and lead to snoring. In these cases, finding ways to beat the sickness is the best way to stop the snoring and improve your sleep. I recently got over a very bad period of 2 weeks in which I had bad headaches and nasal congestion from a sinus infection. Since I couldn’t find time to go to the doctor for it, I decided to treat the symptoms. Every morning, I would boil some water and have a cup of lemon ginger tea with a tablespoon of honey. This, in conjunction with drinking more vitamin C, helped me sleep more soundly and get over the symptoms faster. Almost all sleeping positions you can think of have some benefit to them. In general, sleeping on your back is considered to be the best sleeping position for your spine and for preventing neck or back pain. However, it also happens to be the worst position for snoring. However, it also happens to be the worst position for snoring. You will notice that in this position, it can be pretty hard to breathe without making snoring noises. Sleeping on your back produces the same effect. One easy way to decrease snoring (and maybe even stop it completely) is to sleep on your side. This may not be as good for your neck and shoulders, but it decreases the amount of airway obstruction caused by sleeping on your back. easier for vocal vibrations to occur. Indeed, it is alcohol’s same sedative effects that makes it so good and causing people to snore. In fact, people that don’t ever snore are very likely to snore after having a few glasses of wine before bed. Going to sleep drunk increases snoring because it reduces airway muscle tone; thus making it easier for vocal vibrations to occur. Alcohol is not the only drug guilty of the same crimes- narcotics and sedatives can also reduce muscle tone and lead to more snoring. For such cases where the snoring is caused by narcotics, sedatives, or other drugs, eliminating the use of the drug will greatly help to stop the snoring. Smoking can increase snoring in women because of its inflammatory effect on the airways. In general, the more you smoke, the more congestion you experience and the greater breathing obstructions you experience while sleeping. Even secondhand smoke can be a snoring trigger. As a result from the American Journal of Respiratory and Critical Care Medicine, people exposed to secondhand smoke can be more likely to experience snoring and other respiratory disorders than those that are exposed to no smoke. Interestingly, the same study also showed that out of people that smoke, female smokers were more likely to snore than male smokers. If you don’t want to or aren’t ready to stop smoking (link), you may want to have your last cigarette no less than 4 hours before hitting the sack, to decrease the amount of inflammation that can ensue. As previously mentioned, being overweight can be one of the biggest risk factors for snoring. Though not always the case, losing weight is generally accompanied by better sleep quality overall. One of the main reasons for this is the decrease in fat content around the neck area. The good news is that a bit of exercise and mindfulness about your eating habits goes a very long way towards decreasing snoring and improving sleep. Losing weight and staying fit doesn’t have to be a mentally and physically consuming task. Working smart can be more effective than working hard on the wrong things. I personally only go to the gym twice a week nowadays for a quick 30-minute workout. I’ve been able to keep my weight because I try hard to keep track of how many calories I’m eating while avoiding sweets and low nutrition meals. This one is a bit of a problematic one. Sleep deprivation increases the risk of snoring in women. Similar to alcohol consumption, lower sleep amounts causes loss of muscle tone in the airways and leads to snoring. This is why on TV, characters that come home from a hard’s day work and are in dire need of sleep are often shown to be snoring while sleeping. The issue is that snoring itself can actually lead to sleep deprivation. This creates a type of chicken or the egg scenario. If this applies to you, you should begin addressing the main sources of the snoring, during the meantime, you may benefit from sleeping for a bit longer than usual to compensate for this sleep deprivation. What if I told you snoring had a meaner, more dangerous and annoying big brother? Well, it does, and it’s called obstructive sleep apnea (OSA). OSA is a sleep disorder affecting millions of people across the United States. Similar to how snoring occurs, it also happens due to some kind of airway obstruction. The difference between the two is that people with OSA experience obstructions that cause them stop breathing for a few seconds. They then wake up unknowingly to catch their breath before going back to sleep. Obstructive sleep apnea is most often treated using CPAP, which involves wearing a mask while sleeping that delivers air and keeps your airways from collapsing. Most OSA patients also snore, but snoring doesn’t automatically mean that you suffer from OSA. OSA can be a pretty detrimental condition. People that suffer from sleep apnea are more than twice as likely to suffer from cardiovascular disease and strokes. Additionally, it can seriously affect your day to day energy levels. But don’t worry, it’s a very treatable condition, and treating sleep apnea very often eliminates the snoring as well. Certain mouth features can place you at a higher risk for snoring. A study by Finnish researchers identified certain risk factors that increase the likelihood of snoring in children; among these was having a cross-bite or a receding chin. Since the tongue can have a tendency to accidentally block the airways and contribute to snoring, any jaw or face features that lead to a sagging tongue while sleeping can be a possible contributor. Oftentimes, anti snoring devices try to address this cause of snoring by holding the tongue or jaw forward and reducing any possible blockages that they may be causing. These devices can be very effective for reducing or eliminating snoring depending on your facial features and what other factors are contributing to the snoring. Pregnancy can be a beautiful time of excitement for women. However, this excitement and expectation is not without it’s drawbacks. About one in three pregnant women are affected by snoring. Excess weight gain- It all comes back to weight gain. As pregnancy causes you to increase in weight, your neck size begins to increase. As previously explained, this increase in neck size leads to greater blockages and snoring. Nasal congestion- the increase in hormone production during pregnancy drives mucous production and causes swelling of the airways. These two factors work in synergy to create those beautiful lullabies that your spouse might be complaining about at night. That being said, generally the same methods that are used to treat snoring in general can be used to treat snoring during pregnancy as well. Additionally, most women find that after pregnancy, their snoring improves or stops altogether. If men and women have the same face and throat muscles, why is it that men get all the bad rep for being the top snorers? Though women’s necks are smaller than men’s, they are also stiffer and less likely to collapse and cause snoring. Women have a smaller proportion of fat around their neck when compared to the rest of their body. 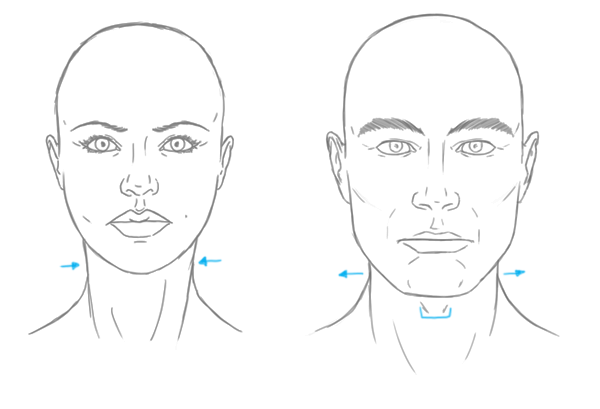 Men tend to have more neck fat. Women have smaller soft palates and tongues when compared to men. Women also have less of the anatomical variances that can lead to snoring. Though women snoring is definitely less common than men, both genders suffer equally from its detrimental effects. As you probably know by this point, snoring is a huge pain for everyone within it’s vicinity. It affects the sleep quality of the person snoring just as much as that of the person sleeping next to them. How’d you like to find a simple way to finally stop snoring and all the problems that come with it? So far, one of the most effective ways I’ve found to stop snoring is by using an anti-snoring mouthpiece. No couple should have to endure sleeping on separate beds because of loud snoring. What if I told you that by this little 1.5 inch mouthpiece at night, you will stop storing, would you believe me? As you know by this point, the tongue can be the largest blockage to the airways while sleeping. The Good Morning Snore Solution works by pulling your tongue forward while you sleep, thus preventing any of the vibrations that lead to snoring. The proof is in the pudding here, check out some of the reviews for the product here see what others think. Try it out for 30 days risk free and get it on discount with our Rested Life Coupon. Snoring can be a big, annoying problem to have in your life, but, it doesn’t have to be a difficult one to solve. I hope this article has been helpful in helping you understand what some of the causes of snoring in women are and what can be done about them. If you have any more questions, please leave them as a comment below. Hello i’d like to explain what my doctor says causes my snoring; my throat is abnormally small and i have very little sleep apnea , what can i do it’s very uncomfortable to sleep with a cpap device is there something else i can do? Hi Loretta. 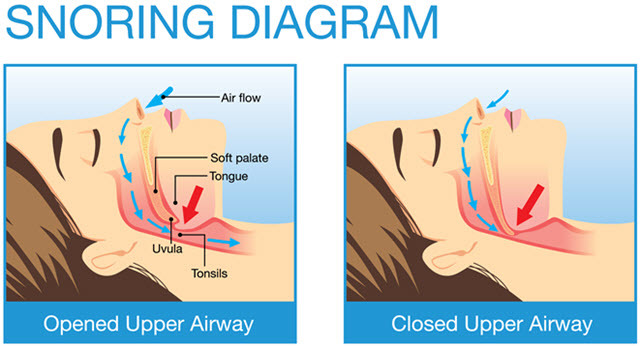 Having a smaller airway is a common reason for having sleep apnea. CPAP is a great treatment method, but when first starting it out, it tends to be very uncomfortable. I know in my case, it took me quite a while to get used to the feeling of sleeping with a mask on. That being said there are other ways of treating sleep apnea that doesn’t involve sleeping with a mask. In my case, sleeping on my side and losing a few pounds of weight has noticeably helped with decreasing my sleep apnea.